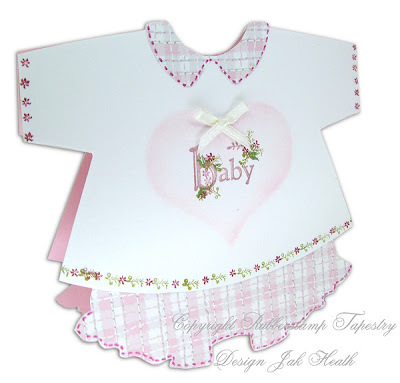 The shape for the Onesie or Baby grower was cut free hand with the fold at the top of the card, the little pocket was cut with a Nestabilitie Label die with the baby block stamped on top using versacolour Atlantic ink then the floral's stamped with Lavender and bamboo colours. I used a blue felt tip pen to mark stitching around the shape and used the flower peg and the lavender ink to make the background. 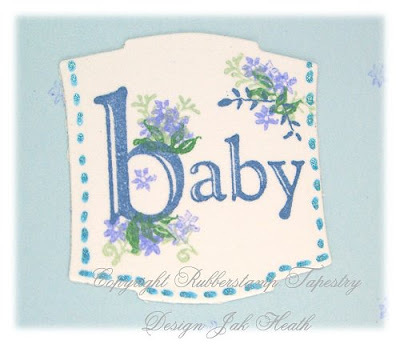 So beautiful, lovely little templates, the tapestry stamping is so nice. Right up my alley, jak!! Beautiful Jak. Just love the way you've used the stamps. Beautiful cards Jak,i specially like the 'Sugar and Spice'one. Stunning carsd Jak. I love those type of stamps. These cards are precious Jak!! These are absolutely stunning Jak, love what you've done on them both. They are beautiful Jak, love them both. Jak these are absolutely precious!!! oohh! how dinky!! These are beautiful, love the stamping, too.